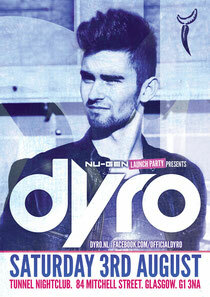 For the official Nu-Gen Launch Party on Saturday August 3, Dutchman Dyro arrives in Glasgow, UK at The Tunnel, one of the city’s legendary venues. With Dyro at the helm and some of Scotland's finest up and coming DJ talent in the other rooms, this looks like being a top Saturday night in the city centre. For many, Dyro’s one of Holland’s future megastars and in 2011, aged just 19, he found that he had both the time and the focus to make the leap from music fan to music maker. A perfectionist, he spent months honing his skills before finally gaining the confidence to put his work online. It wasn’t long before a series of lucky coincidences connected the tunes on his Soundcloud page with another Dutch superstar DJ - and one of Dyro’s own personal heroes - Hardwell. And the rest, as they say, is history. Now, with some killer remixes and collaborations in the pipeline for the months ahead and a growing profile, especially in the US, the future’s looking pretty damn good for the bright young star from Leiden.